Wormer plus, aquatic fish wormer, fluke and parasite killer 4 x 2,000 UK gallon packs. Home » Wormer plus, aquatic fish wormer, fluke and parasite killer 4 x 2,000 UK gallon packs. Now in smart new updated packaging to celebrate 15 years since wormer plus first came out. Many fish come from massive river systems where water changes all the time. This is the difference to keeping them trapped in a ‘glass box’ and with nowhere to escape, unwanted pest can build up and possibly be a problem to fish. Using wormer plus on a regular basis will help keep these pest down to safe levels. If any fish is in good health, not picked on and kept in the correct conditions worms should not a problem. But as soon as the fish is stressed or bullied, its natural immunity is compromised and worms or other pest can take a hold. A sure sign of a worm problem is when the fish still eats, yet is wafer thin with a pinched in look above the eyes. 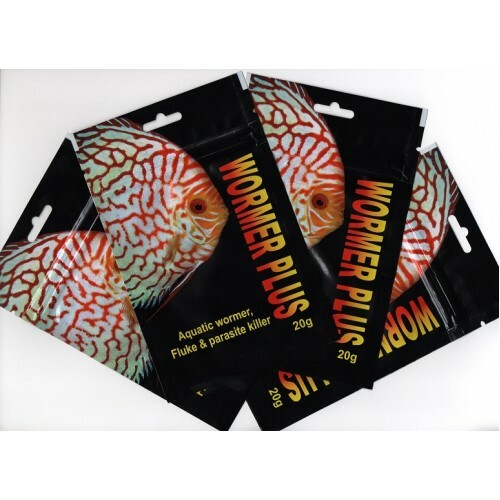 Wormer plus will rid discus and aquarium fish of internal helminths, plus a host of other pest. Although a second dose after four days will be needed in heavy infestations of flukes. So if your discus looks black, emaciated or just worn out use wormer plus on a regular basis and do them a favour. It is not necessary to turn off U/V sterilisation during its application, but it is advisable to remove carbon whilst using this medication for full effect. Wormer plus can be mixed with other aquarium medications, and can be used with puffer fish, and free-swimming fry from one week old. Wormer plus is 100% safe to use in aquariums with plants and will not harm the biological filtration. An easy to use 30 UK gallon measuring scoop is supplied in every pack, making it easy to measure out and to administer the treatment. Full instructions are on the back of every pack. Using wormer plus once a month will help to keep your valued discus and fish in tip top health. Flubendazole is the effective main active ingredient, and works differently to other fluke treatments by gently starving the parasite. Making this product perfectly safe for regular usage. Naturally sourced calcium carbonate is blended in and acts as a gentle booster and ‘pick me up’ after the pests are killed. A minuscule amount of Natural Calcium carbonate (0.01g) is blended with the Flubenzonal to adjust a very slight drop in PH from adding this medication. This cleverly balances out making very little (if any) difference to PH when using wormer plus. Marketed with the small animal exemption scheme, legal, and passed with risk phrases and safety phrases. It is recommended to worm your fish once a month for trouble free fish keeping. To use, simply mix in a food grade container half filled with aquarium water; secure tight fitting lid and shake to mix the medication. Add to aquarium over a one-minute period. Wormer plus will not raise your PH. Complies with the good manufacturing practice (GMP). Discus had a bad name as a difficult fish to keep, some said imposable. Not so, just misunderstood. As long as they have the right conditions and free of parasites they are just as easy to keep as any other tropical fish. Discus keeping in the old days was regarded as a fish shrouded in mystery, and difficult to keep. Just to be kept by the experts and the highly experienced. It is recommended to worm your discus once a month for trouble free discus keeping and this will give them a flying start if introducing new stock. Now keeping your favourite tropical fish has never been easier.